With the schooling period over, I was rather apathetic in entering the new dimension of the trial of life. But I was very much in the hangover of the last episode in SAS last year, especially the Scholarship from MARA to Australia which I had won provisionally subjected to acceptance by a university in Australia. I memorized my file number in MARA, HPM(1)726/F(1)AUST, in case I needed it in emergency. The waiting was very itchy; otherwise I could go for another new "adventure" since local U would not start before May end. In fact before January ended I had posted dozens of letters to the surrounding schools asking for a temporary teacher job which I was very confident in. After so many years, at last, met Ali (the other one, who stayed on the other side of the mosque) at a close range. Boarding gate A9 while waiting to board a MH 1336 to TGG 1440. He said he was ex-Singapore from Tokyo. In particular Sandai. Apparently Ali works in an American Comp of Oil and Gas, operating in South China Sea. An throghout the flight, we reminiscenced a lot. In the meantime, I had all the time I needed to make up for the lost of living with my folks; the childhood friends, Ripin, Raja Daik, Deraman, Mokhtar, Che Wan, Razali, many of them had stopped scooling long time ago, some even had forgotten how to read; and their parents, and many others who were actually parts of my "home"; the friends in school in Padang Midin, and then the added friends in SAS; not to mention the living around Pengkalan Arang Mosque where I grew up; and my relatives near and distant who missed me very much for the past seven years of the most important growing age. Many of them did not expect to see I had grown to that age and to that different from others. A (young) religious teacher at Seberang Takir Army Camp, Ustz Md Din, who frequented to the PA mosque had also been folded into my acquaintanceship; I drew some advantage by being the pillion rider on his vespa to as far as Belara and Pulau Bahagia (visiting Omar). Some friends in SAS still kept a sphoradic cantact through letters, especially my juniors. Very soon after Eid on Nov 30 Monday last year, the monsoon set in, and it was raining almost every day. And in whole Jan this year, it was very wet and the new year was specially marked with a flood; well actually an annual event. I tried several lucks by writing for several possible opportunities like Post Office, JKR, Grammar School (the one and only private school in KT), Board of Governors of every school around, primary and secondary; even to Health Department for a health inspectorate post in Prai, Penang. The results were obvious, but I still admired to these days their PR that none of my letters was unanswered, even my hand-written letter. I tried to recollect as much as possible my boyhood days of frolic with folks: strolling the places on bicycles with Ripin, Raja Daik, and Deraman, most of the times on the pretext of seeing relatives or friends, places or for an occasion or festival; and sometimes with newly friends; fishing in the Nerus river; by then the "games we play" had advanced to include modernly badminton; and I was again around in the living of the mosque. I spent more times on the move than at home although at that time I was the eldest at home as my elder brother was making his life in Kuala Sentul, Pahang. I managed to organise my friends into a knitted friendship through badminton, organise them to make simple badminton courts, playable at night using gasoline lights their fathers were very wiling to lend; one in front of my house although I myself do not have any gasoline light; and arranged for friendly match as far as to Kg Batin (one on Apr 2 Fri night, won 4-3, and another home return match on Apr 9 Fri, lost 3-4), and Banggol Tuan Muda (one on Apr 15 Thu, we won 6-1), Telok Pasu (one on Apr 23 Fri, we lost 0-7). I myself was very bad at the game, sometimes we won by my management skill, but they knew very well that my participation was a source of their internal enjoyment. Then something began to kick in early February. We were called to report ourselves at UM First Residential College for a two-days orientation to go to Australia. I went with Mohd Embong and others; Feb 9 Tue; registered in room B-39. The "orientation" was officiated by Datuk Samad Idris and filled with talks, including En Abdul Rahman Arshad, the Chairman of Examination Board. After the occasion we were asked to apply for the international passport as well as the international health certificate which I completed in Terengganu afterwards. But that was the climax. The waiting was getting more painful until it actually had evaporated; the kick never actually tick. Late February, UPU form was out. I must fill the form irrespective of MARA's decision. STP results were published in the local newspaper on Saturday, March 6, I got through with full certificate and was no doubt very good for local U. Sunday March 14, MARA informed through letter that the nomination in Australian University was not approved. That was it, evaporation confirmed. I immediately ticked UKM as my first choice local U in the UPU form, sealed the envelope and posted. March and April, I felt very much at home, but inched on into the next phase of my trial of life which I was very sure in KL again, and in UKM. The SAS bunch were in close contact, and we even got together to get our forms completed. I snatched every moment to be with my folks. Apr 16 Fri, for the first time, at the age of 20, I was shown to my true blood, by riding the sea to Pulau Kapas for a stroll of the beach. It was organised by Rashid Pengkalan Batu in his uncle's fishing boat. The importance of the trip was unnoticed, I was a bit dizzy during the to-trip in the strong wave but quickly acquired the technique not to get one during the fro-trip. April 20 Tue was my 20th birthday. I did not realised it and I did not look forwad to it before. It was made known to me by the card I received from my ever-cool colleague Jariah. Sunday April 25, UKM informed me of the acceptance. Arrived together was a warrant ticket to Port Dickson for an interview for admission to the Military Academy which obviously I returned back. With the letter I had to distance off myself an inch away a day for the new phase. Today was also an open air film show by Film Unit of the Ministry of Information at the traditional site of Tebing Raja Ali (Pengkalan Luas). I think it was the last for such a folk event, the event that caught me very much when I was a little boy; it did not interest me any more, in fact while the children were watching like I was, I stayed at Raja Sulaiman's shop next to the mosque reading newspaper. In May, I had to fill up all the time to the preparation to UKM, medical check-up, forms completion, etc. I made the journey back to KL on May 9 Sun morning, "stowing" in the bus organised by CheGu Alias (my next neighbour) in which his parents, Pak Ngah and Mak Long were on their way to Port Kelang en route to Mekkah by ship. I dropped at Sugai Way, and located the Police Station in a taxi, and the family of Mek Ayah Nuh whose husband was a constable, Abang Sehat (MM 27117) in the station. I have arranged and planned to stay with the family for my tenure in UKM, at least initially. The following day, I took a bus to SAS and paid a visit, my first revisit, to my junior friends there; and the days that followed I scouted for former friends who were registering either in UKM or UM. 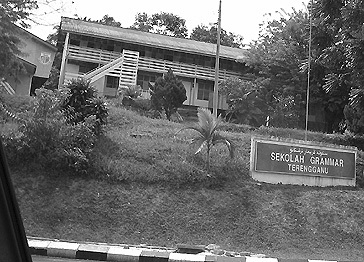 UKM temporary campus in Jalan Pantai Baru; next to Language Institute, former MTC in 1971. A new tall building, known as G Block was erected in the middle of 1970 to cater the expanding needs. Monday May 17, I registered in UKM, in Fakulti Sains. MARA scholarship was transferred to UKM without my informing it. Interestingly my name was also in the list of Kementerian Pendidikan scholarship whom I had also not informed that I was checking in UKM. And more interestingly the names of my SAS friends who went to UM were also in the list in UKM. What I gathered later was that we were needed to fill up UKM, then in its second year. It was a default assumption that all STP M-medium passers checked in UKM, and that was also the partial reason for MARA nomination disapproval to Australian university. This is the second year for UKM. I knew most of my senior in Science Faculty because most of them were my seniors in SAS. Most of my course mates were SAS-ian too, only a few were added from other less known six-form schools. Out of my pack of ten of 67, Abdullah Yusof, Mohd Embong and I went to UKM, all in science faculty. Omar and Othman made an eleventh-hour decision to go to agriculture faculty of University of Malaya. So did Zawiah, who re-met her fellow friends like Zaharah. Jalil made an early decision since in SAS in 70 that he was going to a teachers college. So did Abdullah Embong. I re-met many old friends from PM. In particular, Khamsah, Nik Akiah and Wan Fatimah. And I befriended with many new ones, in particular those at FPI from KIK, because majority of them were fellow state-mates. in particular Md Yusof Karim (Arts Faculty), from Melaka, a teacher in Padang Midin last year. We went to MARA HQ together to sort out our sponsorship. He played an important role in my uneasy time the following year by giving me shelter. MM 27117 and Mek of Sg Way Police Station. Abang Sehat, MM 27117 in Sg Way Police Station was a Johorean, married to MekAyahNuh, a distant relative whose family was extremely nice to my family especially my father. I leave to your guessing to why I did not choose to stay in the residential college. The constable quater I was staying was very small, practically one-bedroom semi-permanent dwelling structure; shared bath room with other family. I was later joined by Fadil Othman, Zubir Ramli and Hamzah Mohamad, all were SAS friends. So the constable who was childless was very glad and proud with us to stay with him. When they joined it happened that a next unit was vacated. It was "cut" into two halves; the front half was used by the neighbour constable, PakChik Hamid, while the back half was for Abang Sehat to become our room. So there we stayed for 150 ringgit a term including two meals a day. I learned later that many of my SAS friends went to Indonesia for their degree. It appeared that they were called by the JPA, just after we were briefed by MARA in UM in Feb. Among them were Izzuddin, Husin, Azmi, Idris, Manan, Radzi and many others. Sulaiman went to MU instead, steadfast to his engineering ambition, like the one he was awarded a scholarship by MARA to go to Australia. I met him several time at his rented house in PJ, went out several times with him, including visits to SAS, and he came to my place in Sg Way once in Oct 3 Sun, then we lost contact. 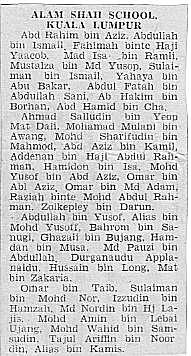 And the 1971/72 session went on, the first lecture was on May 24 Mon; Prof Achmad Amiruddin taught Chemistry, Dr Ansjar taught Maths, Dr Wiloyo Laeksmanto taught Physics, and Dr Kardinal Kunaeni taught Geologi, all were Indonesian on loan mostly from ITB. I did not take Biology at all. I visited SAS several times during my early UKM tenure, including the girl hostel in Jalan Hale, Kampung Baru. The contact eventually disappeared when my next-juniors in SAS themselves left the school in Dec like I was. The last visit was perhaps on Nov 28 the whole Sun, to Norsiah in the hostel Jalan Hale, Kg Baru, then in the whole KL down to Zoo Negara and Kajang's sate stall. The first term exam commenced on July 26 Mon for the whole week, followed by the first break to be resumed on Aug 23 Mon. 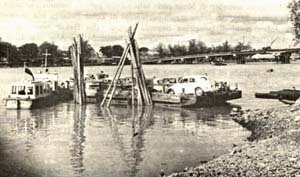 And the ferry at about the end of her service near the bridge; the same kind that operated in Bukit Datu - Losong in Kuala Trengganu which ended in early 1960 when Manir bridge was opened. Initially I went to the campus by bus, but as a life in U, on May 22 Sat, I "took" a Yamaha 70 (BAA 9725) at Soh Motor, Bangsar. One need to produce only the U matric card for the shop to register a bike one wanted (unfortunately only Yamaha) of about 600 ringgit, and pay the installment as the scholarship arrive, in a couple of month. From that moment I thought I had made my life, and tried to become one in a pact who stayed off campus with own bike. For the first time I joined them in a ride to Pantai Morib on May 30 Sun; and then a long biking with Fadil to his home town in Parit Raja, Batu Pahat during the very first day of the first term break in late July. For that brief new phase I drifted very far away from home and never looked into myself in depth. The friends and contempriots around had enveloped into making a wrong move; one of them was leading me into returning the Yamaha to Soh Motor for a more prestigious and more costly Vespa Super at Guan Thye Motor (BAB 7816), also in Bangsar on Sep 8 Wed. It was Abang Sehat's idea that I should take a kind of tuition to help me with my needs in U; and it deliriously attracted me. He found the host, a neighbour constable's form 5 son, a form 3 daughter, and a std 5 son; and on June 1 Tue I began the tutorial with a promised monthly 100 RM fees, two nights a week. It lasted at the end of the month when the promised fees did not turn up. Some how Fadil had managed a close contact, through his senior relatives, with Kampung Pandan's Residence Council who organized tutorial class for their children. Fadil had been tutoring there since last term, and once a while I went along with him to help him. Staying in the police station and having a constable as host, a senior one who knew many people up to PJ in all walks of life, was full of advantages. My riding licence was arranged in order and with a close contact of the MM with En Abbas in JPJ, I passed my riding licence in PJ on Oct 7 Thu, with the Police Station add. Since then I was very mobile indeed. Ramadan clocked in on Oct 21 Thu, a week before 2nd term break began; and for the first time I rode the vespa all the way from KL to K Trg, home for the first time. Harun (Mek's nephew-in-law) was the pillion rider. The Eid was on Nov 19 Fri, and I spent it with the family; returned to KL on Nov 21 Sun, to resume the 3rd term lecture on Nov 22 Mon. By the end of the year, the police station was to be reconstructed. Abang Sehat had to move in a temporary place. We went along to stay with him at No 5, Jln 23, down the road, a shoplot actually, on Dec 25 Sat. With that the accomodation appeared to bite us. Fadil and Zubir made some adjusment by frequently squatting in the college. My first contct with the mass media, (apart from the school megazines, and the one entry in 1969 to "Peraduan Mengarang Bahan2 Bachaan untuk Pembacha Kenal Huruf Baharu" of the Ministry of Rural Development), was in April when my "pendapat" in "Peraduan Pendapat Pembaca" was published in MM on June 1 Sat. It was not the winning "pendapat". Then I tried again the one organised by the Agriculture Faculty of UM, and finally my X-ray article was published in MASTIKA in June, and I received the 35 RM honorarium from Utusan on June 16 Wed.
Badan Mahasiswa Terengganu (precursor to PERMATA) protem committee, chaired by Jamaluddin Jusoh, met on June 20 Sun in FPI (in which there were many from Trg and had quickly befriended me for some of them had either knew about me, or whom I had known before in Trg, or simply were my distant relatives) and I was elected to represent Science Faculty in the pre-society.